Just to follow up, they're giving away a free MaxJax car lift on the GES website. Soooo.. I guess spread the word hehehe. Strong possibility I'd be in for a group buy..
Don't forget the group buy over on the Garage Journal, tomorrow only, $1,800. I have had my MaxJax in operation for over a year and have put them to good use. My only complaint relates to positioning the unit in front of the car. Others have mounted them to a nearby wall. 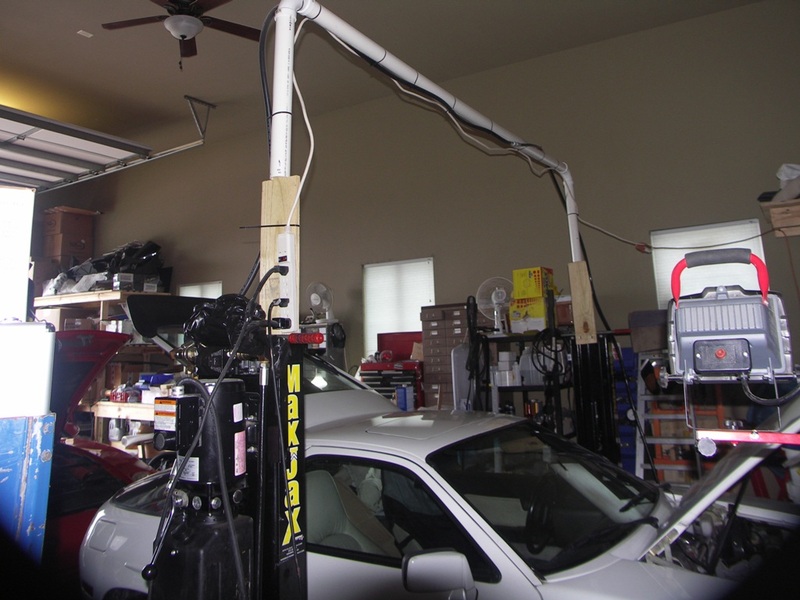 One of the options I am considering is mounting the pump and reservoir to one of the lifts, having a short pressure hose built and connecting the the two long hoses to go over the rafters in my garage to the other side. The plan is to mount the unit low enough not to make the lift top heavy. Would --probably-- be OK, but... The reservoir is pretty full, and there's a primitive vent on the front that looks a lot like a sheet-metal screw through the plastic. If you mount the pump to the column, the reservoir will leak through the vent screw every time you tilt the column to move it. In my first installation before mounting the pump to the wall, I added a 10' hose extension to one side so I could leave the pump at the wall at the corner of the car, handy to the outlet. I followed that up a while later by making a wall-mount for the pump, so it would be up off the floor and relatively out of the way. The latest install adds about 20' of hose to the other side, so it can be looped over the garage door. At this point the quick-disconnects are on the garage wall, hanging about a foot off the floor on either side of the garage door. The hoses tuck back under the raised cabinets when the lift is in use so they present the minimum hazard to navigation around the lift columns. I'll be adding a couple more 45º fittings to the column bases so the hoses can connect horizontally, with a little offset that allows access to the rear center bolt. Separately, I added felt pads to the hard points on the bottom of each arm, and added about 1/4" of metal shim under the cylinder rod. This keeps the arms from scraping the floor finish. More critical in the first install with epoxy floor finish, not so necessary with the current install with porcelain time floors. I hang the arms on the sides of the columns while not in use, where the felt pads protect the paint on the columns. Interesting about the cap - had not considered that - the other change I would like to make is a few big *** washers under the lift pads so they swivel easier. Mine has a Tek screw an inch below the filler cap, to vent the reservoir. I added some pipe thread sealant there to help but the still needs to be some way to let air in and out as the lift goes up and down. It 'seeps' if the reservoir level is that high, and would when you tilt the column. Adding washers to let it swivel easier means load is concentrated on those spots. Probably not an issue directly on concrete, but would damage paint or tile floor. Kevin, this is not advised as there is the chance that your motor mounting points could be sheared by the slide blocks on the inside of the columns. Also, the previously mentioned breather vent in the tank could create a mess for you. This is not recommended as doing this will effectively make the pad pins shorter. You want as much interlocking between the pad pin and the arm slot as possible. You could try something like a small amount of WD40 or a light oil/grease. In general, we do not recommend modifications to the pin or slot as lubrication could, in extreme scenarios, lead to the pad slipping out and the vehicle freeing itself from the lift. In short: Keep it simple silly. Is there a reason yo mounted it at that height. I was thinking lower for a lower center of gravity. Higher up so the through bolts don't interfer with the sliding blocks inside, easier reach to the up switch and down handle + more space from the lower hydraulic disconnect has worked well for me. Wider spacing allows for doors to be almost fully open on the lift. 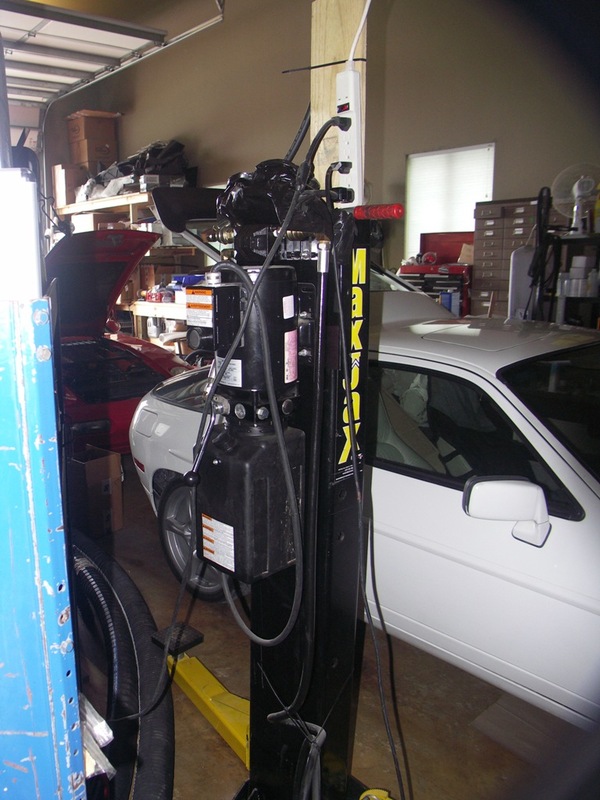 Lift has been used to lift full size pick-ups, MB long body sedans MB 500SL and 928's without any problems. I've kept mine 'mobile' so I can get the columns out of the way in the workbay when the lift isn't needed. So the semi-permanent crossover hoop isn't practical for me. This mobility of the columns was the primary reason for choosing the MaxJax over a more permanently mounted 2-post assymetric lift. As far as choosing column spacing, the wide spacing I use for the 928 and the Honda Pilot, with pick points under the rocker sills, is wider than I can use for certain other cars with subframe lift points closer to the car's centerline. There are 8 holes and anchors set in the floor under each of my columns giving 3 column-space options. My hydraulic unit is mounted at chest height for convenience, and so doors for the adjacent cabinet can open fully. Plus the controls are at a very conveninet height, no stooping needed. But now I can't nudge the release valve lever with my knee anymore. On the "...big-*** washers under the lift pads so they swivel easier." -- Might be OK to add 1 when you are using the pads without the standard 3" pins. Seems like there's more friction than needed there, so I'd start with a bit of easily-removable non-staining lubricant (think Vaseline), and maybe do a little clearancing at the pin holes to make them easier to turn. I haven't made enough lifts without the extension pins to make that effort seem important. Looking more closely at the pins under the pads, the weld is turned smooth so there's about 1/4" width of flat area holding the pad up around the outside of the pin. That would normally be perfect, except that the rubber pad cover is thicker than the weld, so it's the rubber cover that's dragging on the arm making it harder to turn. You'd need to add another 1/4" or so to get the rubber off the arm. But... Why is that important? The pad is rotated to lne up with the lift point on the car before any load is added. The only inconvenience is that the rubber preloads the pin sideways a bit after it's had weight on it, so it might take a little effort to get it loose for removal. Solution: A light spray with WD-40, or maybe some dry silicone lube, in the hole in the arm where the pin sits. With regard to Serj's comment from Danmar, adding a 1/4" spacer won't materially add to the risk of the pin coming out. There's no more overturning force applied with a washer there than when the shorter pin extensions are used under the pads, and much less than when the 6" extensions are used. If the load is reasonably centered on the pad (center of vertical load force over any part of the pin), the static overturning force is virtually zero anyway. Serj, consider adjusting the pad dimensions so that the machined 'bearing' surface at the weld is lower by 10mm or so, and extend the pin by that same amount. Of course this means that you give up 10mm of extra pad height when you try to get under a very low car. I use the supplied 3" pin extension spacers for the 928 regularly, sinc there's room for them under the car's jack points plus it adds 3" of lifted height to the car vs no spacers. You bring up valid points in terms of the math and the actual forces at work. As an OEM rep, I am all but required to ensure customer safety and condoning those washers COULD lead to scenarios in which man or machine is damaged/destroyed. I have to play it safe in other words. I will review the pads in house and if there is a reasonable number of pads that are exhibiting this behavior, I will talk to the higher-ups about this issue. Regarding the possible modifications and low clearance cars: most users make or buy some variety of race ramps to accommodate their car/lift combo in this situation. I will reply back to the thread once I know more about possible modifications.